State Treasurer Dale Folwell gave a chilly reception to issuing a statewide school construction bond even as Gov. Roy Cooper hit the road Tuesday, July 10, pitching one. North Carolina has $50 billion in unfunded retirement system and State Health Plan liabilities. More debt is pending from the $2 billion Connect NC and $3 billion Build NC bonds approved the past two years. That makes Folwell jittery about adding to the pile of financial obligations, including the debt’s effect on the state’s AAA bond rating. Cooper was scheduled to discuss the need for a statewide school construction bond at Stough Elementary School in Raleigh, and Community High School in Swannanoa on Tuesday. He proposed a $2 billion school construction bond referendum for the Nov. 6 general election as part of his budget. Efforts to put a $2 billion school construction bond on the ballot failed last year, also, but the issue remained alive in public debates. The treasurer’s office compiles a debt affordability study at the first of each year. It shows how much more public debt the state could add. Given the 2018 debt affordability study, done before the Build NC Bond Act of 2018 was approved by lawmakers in the short session, and “especially with rising interest rates, you can see where we need to be very careful about the amount of debt this state takes on going forward,” Folwell said. He would have to recalculate the most recent debt affordability study to determine whether the state can borrow more money and meet payback obligations, he said. “We are going to market next week with only the second piece of the Connect NC bond” approved by voters in 2016, Folwell said. “We are just not in a position to be issuing debt and having the money lying around waiting for somebody to get their ducks in a row” to begin construction, he said. So any discussion of future debt must include whether projects are ready to start. That didn’t happen with the Build NC program, Folwell said. No one’s sure what projects will be included, and when construction would begin. That makes it tough to calculate whether and when the state could take on more debt, partly because interest rates, labor, and materials costs could rise. “I’m in favor of transportation. I’m in favor of those that advocate for transportation,” Folwell said. But he didn’t support Build NC for several reasons. Among them: It didn’t require a vote of the people to approve the debt. “As the keeper of the public purse and the state treasurer, I felt very strongly that any time that you’re going to increase the state debt by maybe 40 percent, that the people that you’re increasing that debt on the backs of need to have a say in that,” Folwell said. “I don’t recall any time where the voters have turned down a transportation bond in this state,” he said. Still, lawmakers did not put the measure to a public referendum. 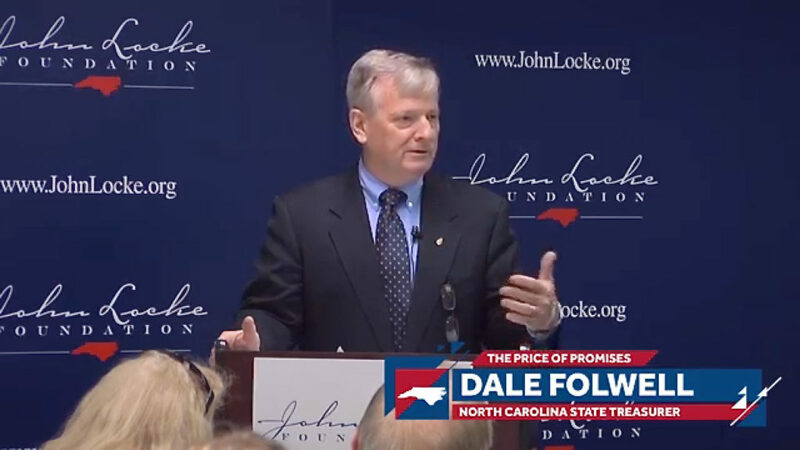 Folwell called for transparency and for Build NC to go through “the normal appropriations sunshine process that reflected the priorities previously set for how spending on transportation projects would occur.” He said any new debt should not violate the debt-affordability study. The state has $35 billion in unfunded liabilities in the State Health Plan, and the state hasn’t set aside any money to cover it over the past 40 years. Another $15 billion of unfunded liabilities accrued in the state retirement system. Its investments have not hit the assumed rate of return on average in two decades, and they aren’t expected to meet the target rate for another 20 years. The bill he sends to the General Assembly every year for pension and health-care costs continues rising, and needs to be accounted for as part of the state’s debt capacity, Folwell said. He was the first state treasurer to put those unfunded liabilities into the debt affordability study, giving a more accurate assessment of the state’s financial obligations.